Making stringed musical instruments has a centuries-old handcrafted mystique that reaches back to the famed violin workshop of Antonio Stradivarius and beyond. But modern instrument manufacturers have found ways to integrate automation into their woodworking operations in ways that not only speed production in even the finest instruments but also enhance precision and still leave room for hand craftsmanship. A visit to two manufacturers near San Diego, Calif., shows how much has changed from the days when nearly every part of fine musical instruments was built by hand, one piece at a time. Taylor Guitars in El Cajon and Deering Banjos in Spring Valley both had their roots in that kind of production. Both their owners started by building instruments themselves with few tools, one guitar or banjo at a time. But that was 30 years ago. Today, both companies have international reputations for quality, and their instruments are sought out by top recording artists and performers. Their modern plants now make many of the most crucial parts of those instruments using sophisticated technology, including computer design, multi-axis CNC machines and laser cutting. Both Taylor and Deering began as craft-based businesses some 30 years ago. When Bob Taylor and Kurt Listug started Taylor Guitars, the production was just six guitars a year. Now it is 267 guitars a day. Greg Deering and his wife, Janet, began in a similar fashion, emphasizing high-quality, individually crafted instruments that responded directly to musicians' tastes. When Deering Banjos was born, the company had to compete with 100-year-old famous-name companies with huge advertising budgets. Now 30 years later and with fewer than 40 employees, Deering has managed to capture the banjo market to become the largest banjo manufacturer in the world, according to Deering. For both companies, adding computerized processes was a natural step that allowed them to offer the highest quality and precision while meeting the needs of growing markets. Deering cites as a prime example the shaping of banjo necks. "Carving a banjo neck is an extremely high skill," he says. "It's more than craftsmanship. It's artistry. Quality suffers without skilled artists." 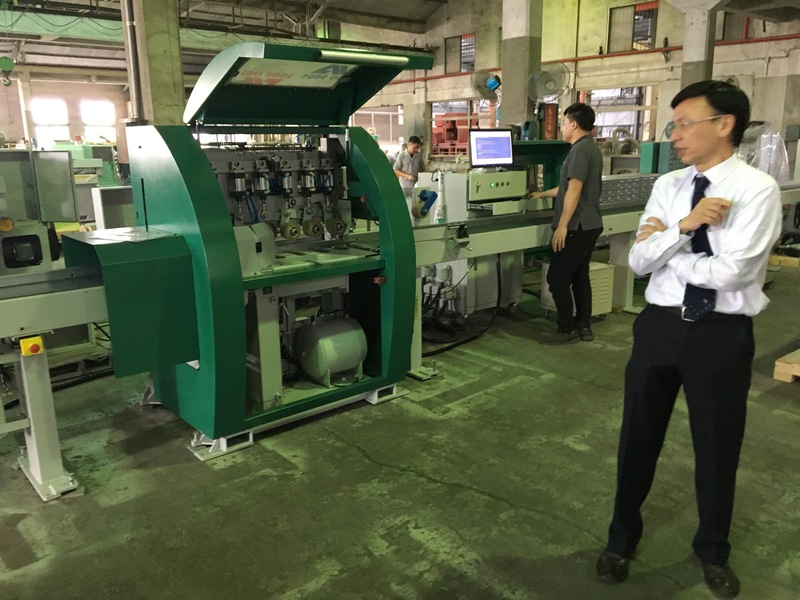 About seven years ago, the company bought its first CNC machine, a Fadal three-axis CNC milling machine, designed originally for the metalworking industry. That machine has no trouble machining the 15 separate surfaces in a typical banjo neck and doing it right time after time. Two years ago, the company added two more CNC machines, both Haas three-axis milling machines, to further expand involvement with CNC production. Now the company not only does woodworking on the CNC mills but also machines some metal parts, such as banjo flanges, on the machines. Before he brought in CNC machines, Deering spent a lot of time developing specialized proprietary jigs and fixtures that would work on conventional machines like SCM Mini Max shapers, and many of those jigs are still in use. But the continuing trend has been to automate as much as possible wherever it will enhance the quality and consistency of the product. Inlays are a good example. Fine banjos are known for elaborate fingerboard and peghead inlays, typically in mother of pearl. "When we started out, all the inlay was cut by hand," says Deering. The next step was to use a pantograph cutting system, and now it is going to computerized systems. 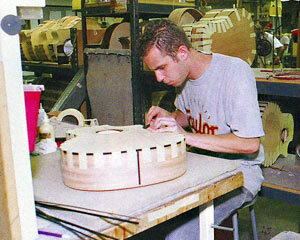 Taylor entered the world of CNC machining 15 years ago, searching for a more accurate way of reproducing guitar parts. Like Deering, Taylor opted for CNC milling machines from the metalworking world rather than ones originally designed for wood processing. "We use the Fadal vertical machining centers for a variety of reasons," says Matt Guzzetta, one of Taylor's industrial designers. "Fadal was the first affordable CNC machine that had a 15,000-rpm spindle and had the accuracy needed to produce the fixtures and guitar parts at that time." Guzzetta also notes that the company has kept with Fadal through dramatic changes in production levels. "At the time Bob purchased the first Fadal, Taylor Guitars was making about 12 guitars a day," he says. That compares with production in excess of 260 guitars a day now. "Other machines now have the high-speed spindles and would work as well as the Fadal, but we have a great relationship with the company and are able to do all the work on the machines in house with our great staff," says Guzzetta. 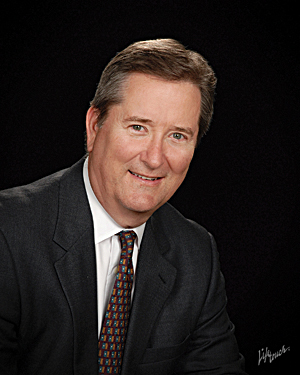 "Just the parts inventory and different operating systems would make it difficult with 30-plus machines in production. The vertical machining centers are very versatile and take up little floor space." Taylor has adapted the CNC machines to a wide variety of processes and guitar parts to be machined. Rows of Fadal CNC milling machines help Taylor's more than 400 employees, working in three shifts to manufacture hundreds of guitars each day. Andy Robinson, Taylor's media relations manager, says the real contribution of the CNC machines is not so much production volume but accuracy. "The CNC machines are key to incredible accuracy," he says. "We can work to tolerances of 0.0001 inch." Much as the company has remained loyal to one CNC supplier, they've also remained loyal to the maker of the software used to program the machines. "We use MasterCam for our machine programming, as it was the most readily available, powerful program at the time Bob purchased the first Fadal," says Guzzeta. "We continue to use it as it is a powerful program that is easy to learn, and we have thousands of legacy files to keep up. " Besides CNC mills, Taylor uses three laser cutting machines from Laser Machining Inc. The machines can precisely cut the complex shapes of guitar backs, tops and sound holes. They can also laser-engrave some sound hole decorations and logos, and they can precisely mark key locating points so that parts can be properly oriented in jigs and fixtures during other parts of the manufacturing process. The high-tech equipment at Taylor still co-exists along with many hand processes operated by skilled workers. "Eighty to 90 percent of the work is still done by hand," says Robinson. "About 10 percent is CNC." Workers are set up next to the CNC machines to do hand work on parts as soon as they are processed by the machines. For example, a worker uses a hand-operated arbor press and special jig to press frets into freshly machined fingerboards. In the rough mill shop, delicate tone woods are precisely sliced with an Ogden band saw to create soundboards, backs and sides. A Grizzly spiral cutterhead jointer is also in use. And like Deering, the inventive folks at Taylor have created a wide number of special jigs and fixtures to make work more precise and efficient, including gluing carousels to hold multiple assemblies and special heat feedback systems to make bending guitar sides more precise. Final setup of instruments at both Deering and Taylor has always been and likely always will be a hands-on process. Sometimes there is just no substitute for the human touch and ear.